I went to church last weekend. I gathered in a circle with twenty-some people and we shared our stories. We laughed together, encouraging one another, but we also made sure to point out where each person could grow better, stronger, bolder. It was a time to hear and be heard. To grow and help grow. A time when everyone was excited and accepting and eager for more. A time to let down our walls, exposing pieces of our souls to strangers. A time to fall in love with those strangers because of it. “This is the way church is supposed to be,” I thought. But, of course, I can’t remember the last time church has looked like this for me. Because this experience I had last weekend didn’t take place in a sanctuary; it took place in a Student Center at Ball State University. We weren’t talking about Jesus; we were talking about writing. And before you ask, yes, that is a spiritual experience for me. I carried it with me—this definition of church—through the remainder of the weekend. You might think it would be hard to even consider a word so sacred and spiritual while playing Cards Against Humanity, but that’s where it hit me the hardest. As the owner of this filthy game struggled to remain somewhat respectful for the sake of her good little Catholic companion, it was hard to imagine anything but the Holy Spirit at work. Because that’s what blew my mind. That we were so very different at our cores and yet… Our experiences didn’t matter. Our worldview didn’t matter. Our politics and religion and culture didn’t matter. We were all storytellers, and that bound us together in a way that would be impossible in any natural realm. I wish I knew of an actual church that worked like that. Maybe then I’d make an effort on Sunday mornings. Maybe then I wouldn’t find myself wishing for excuses on Wednesday nights. Maybe then church would actually make a difference in my life, rather than be that mandatory thing on my schedule. I’m sorry to say that is what church has become in my life—an obligation. I think my idea of church is comparable. Not because I believe in robbing people, but because my idea in itself is so drastically different than the cultural norm and, frankly, a lot more exciting than a church built on tradition. I do crave it. Not church as it is, but church as it should be. Church like my writing community. Because, I swear, if someone would talk to me about Jesus the way my coworker talked to me about Anita Blake the other night, I would be on a spiritual high for a month, hallelujah. I just want a church that pushes past the fluff and the tradition and the agenda, and gets straight to the heart of it. I want a church where people ask their questions and share their stories and dare to risk rejection only to find acceptance instead. I want a church that isn’t divided over experience and worldview, politics and culture. I want a church where we can overlook and even accept these things. Where we can learn and even grow from these things. Because no matter what our other loves, we are all lovers of Jesus. And that binds us together in a way that would be impossible in any natural realm. These words, penned by Kelly O’Dell Stanley in her book Praying Upside Down, sting me with their truth. How many times have I used these tools without thinking of their true purpose? How often do I look at these things like they are just one more accomplishment to mark off my checklist? Seriously, I have a habit—a routine, if you will. I read a chapter of the Bible followed by a chapter of an inspirational book. If I’m really on a role (i.e. when I decide I have time to spare), I’ll read another chapter of the Bible followed by a chapter of a different inspirational book. Sometimes I’ll find a cool quote to scribble down in my journal. Sometimes not. Sometimes I take my time, but other times I’m in a rush to flip through the pages and get on with my day. Then I pack all my books away and call it time spent with God. Really? Did I really spend time with God? Kelly Stanley disagrees (and I think God might take her side on this one). 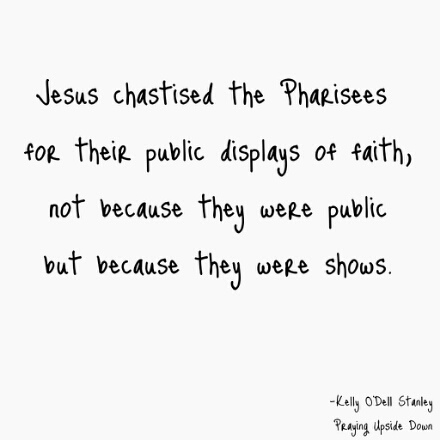 Confession time: Sometimes my own faith becomes more of a show, even if I’m only performing for myself. Because it makes me feel good to think I made room for God today… even on those days when God feels that He missed the invite to my little party of spirituality. If you’re like me, you’re probably struggling a little bit with this whole idea of the Bible being a distraction from God. After all, it’s the God-Breathed Word of God. How can it do anything but draw us closer to the One who wrote it? This morning, I buried my face in a chapter of Lamentations and learned absolutely nothing relevant to my life today. Maybe it’s because I wasn’t really looking, but perhaps (dare I say it?) it’s because the answers aren’t there. Seriously, though. There is a lot to be learned from the words God ordained to be recorded in that holy book, but nowhere in the Bible am I going to find the words in red that say, “Thou shalt wait tables while waiting for your writing prowess to be acknowledged by agents and publishing houses alike.” The Bible gives me the generic, but not the specific. Only a lifetime spent seeking God’s voice through other mediums, such as prayer, is going to lead me down the path He specifically intended for my life. But I, like Kelly, am afraid. Afraid of the way He shines light on my darkness, exposing it all. I’m afraid to get honest and open and vulnerable even with the God who knows it all anyway. Because the person I’m really afraid of being honest with is myself. Because if I were really to acknowledge the darkness, I would have to work at transforming it into light. Sure, people will tell you God takes the darkness away, but you have to let Him. And if you’re going to practice true, Godly living, you can’t just keep coming back like, “Oops. I messed up again,” just because you know forgiveness will be extended; You have to intentionally work to keep the darkness at bay so as not to take advantage of God’s endless grace. That’s a huge commitment–dying to self day after day after day. So sometimes I take the easy route and let the Bible serve as a distraction, turning my daily Jesus routine into a big performance for my audience of me. I don’t think it’s a secret that I’ve taken a break from Beyond Waiting for a season. I had been pursuing other things for a while, and this just seemed to be taking up more time I didn’t feel I had to spend. And, to be honest, there was always The Fear. The Fear has been there since the idea for Beyond Waiting first sprouted in my mind. The Fear that nonfiction was out of my comfort zone. The Fear that my voice would just be adding to the noise (because there is a lot of noise when it comes to singleness and praying God will bring the right man along soon). The Fear of branding. That was one thing I had learned about the publishing industry. You had to be branded, like cattle, which sounds like a painful and demeaning exercise to me. I was scared of it anyway—to be crammed so precisely inside a box and confined to writing in a way my readers would expect. I had bigger dreams than that. I read all the things and I wanted to write all the things. Except this thing. Because if there was one thing I knew for certain, even at eighteen years old, it was that I did not want to be branded as the Singleness Guru. Still, in obedience—often begrudging obedience—I wrote the book, published it through ANM Press, and left God to do the rest. That was part of the deal. I would write it and He would market it, and I wouldn’t have to worry my pretty little head about what became of Beyond Waiting. I moved on with my life, trying to leave that book in the past as much as conviction would deem possible. I started writing what I always wanted to write. It was only fair, I reasoned. In writing fiction, I’ve managed to push everything else aside. I told myself my moments were better sent ironing the wrinkles out of this novel I’ve created. I blamed Time. I blamed Priorities and Calling and a handful of fictional characters who pop into my thoughts at any given moment. But I never blamed The Fear. And I certainly never blamed Resentment. Yes, in many ways, I resent writing Beyond Waiting. I resent that this is the work that declared me “published.” I resent that I’m going to have to try explaining it to a secular publisher some day. I resent that it might make the marketing people want to publish me under a pen name. You guys had better believe I’ve spent the last month praying I’m married or at least engaged before my first novel comes out… just in case I need an alternate name that is, in fact, my own. That’s how much I resent Beyond Waiting. And it did. I deleted no fewer than forty-three emails. But there were also a rare couple of gems in there. Two people had popped in to tell me how they had just become acquainted with my words. I AM. It’s a name, it’s a statement, it’s a fragment for crying out loud. I AM… what? What exactly are You? God’s the only person I know who can perfectly sum Himself up without even bothering to finish that sentence. You are. You are, You are, You are. And because He is, I have far more power than I ever gave myself credit for. But then, I don’t deserve the credit anyway. Lately, I’ve been writing for myself. I mean, I hope one day the words I’ve been painstakingly crafting will be shared with the world, but for the moment, they’re mine alone. And I’ve gotten pretty selfish in my unsharing. So I’ll be back, dear ones, with the words I’ve been so hesitant to say. And Katie and Rebekah, I fully intend to respond to your emails personally, because they are beautiful, and you are beautiful, and you’ve reminded me of the reason I’m on this earth. I’m truly and finally thankful for this space and the people who make it worth coming home to. See you soon, lovelies. Last night did not go according to plan. I walked into Bible Study intending to reinvent myself. To be a louder, bolder version of Rebekah Snyder. To finally carve a little space for myself in the midst of this community. This didn’t happen for a couple reasons. One: an old friend showed up, so of course we spent the evening catching up on life. Two: I looked around the houseful of thirty-some people and could practically feel myself shrinking, wallflower that I am. When I woke up this morning, I had no intention to write a blog post, at least not on Beyond Waiting. I was going to write something very poetic about wallflowers on my other blog. Wait, what? Rebekah has another blog? I first started rebekahsnyder.wordpress.com so I could play around with formats without completely ruining this blog. I threw the first three posts up there just so I could get a feel for the layout. And then I wrote something else. Something that was probably the most vulnerable piece I have ever written, but I couldn’t post it here. Mostly because I didn’t want to risk the subject seeing it, but also because it didn’t fit the style I had created for this blog. And that is how Vagabond became the home for all the words that haunt me. The ones that aren’t safe. The ones that aren’t pretty. The ones that don’t fit the image I have crafted for this space. So why would I mention it now? So I’ve decided to stop hiding. I’ve decided to come out right here on this blog and confess that, yes, perfectionism has clung to me like a second skin, but I am oh so tired of not wearing my own. While this blog has shifted and grown so much over the years, it has never been completely real. Although everything I have shared has been truth, I’ve never been fully honest. I’ve tried to be strong. I’ve tried to be the encourager. I have tried to be light in this world. But I’ve never let down my hair. 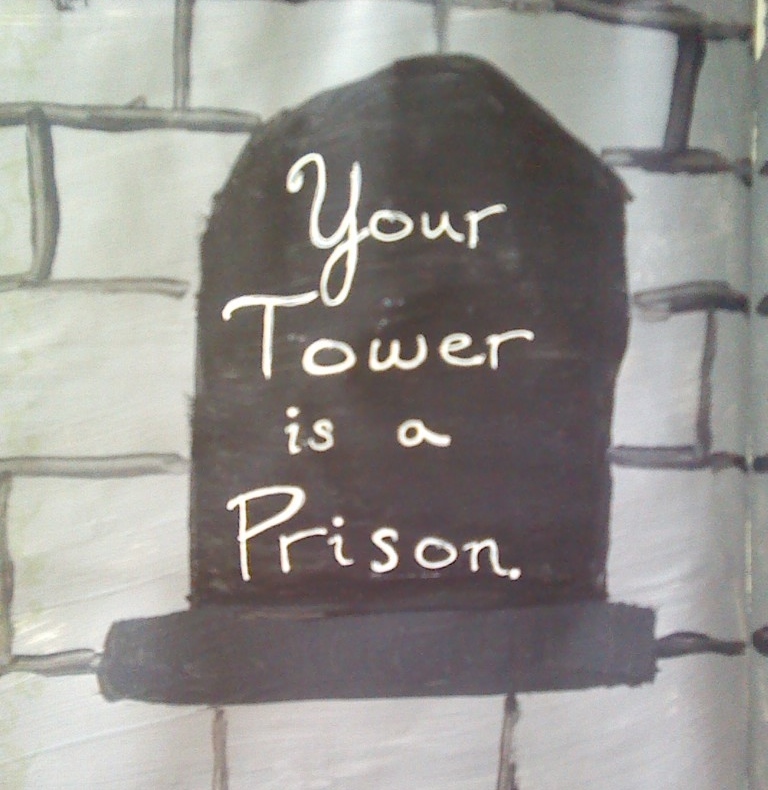 I’ve never come out of the tower. I’ve never told you that I might actually be Rapunzel. Oh yes, I Rapunzel so hard these days. So I want to invite you to read the post that I first protected like a secret. 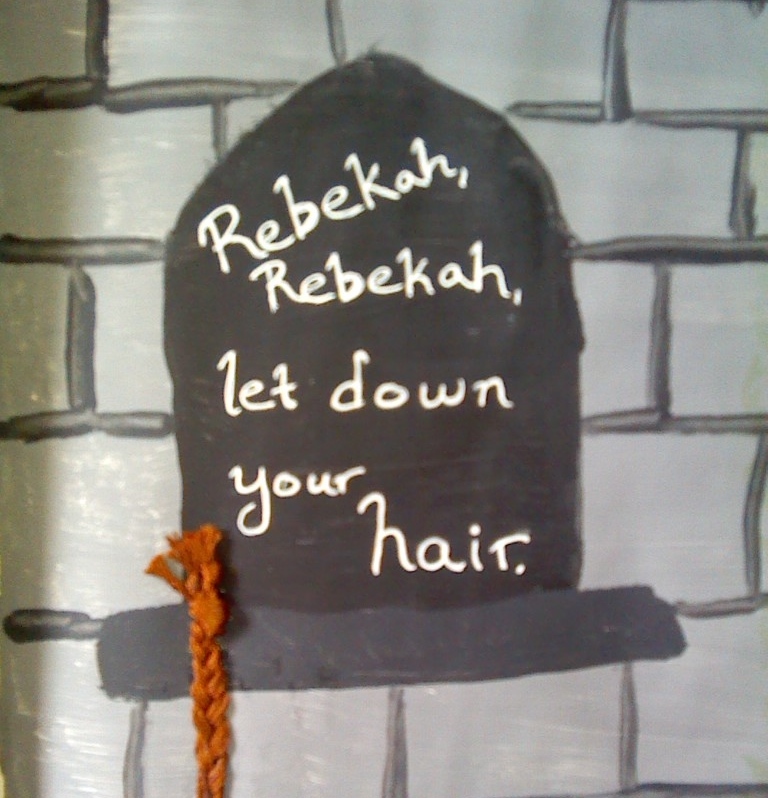 Oddly enough, it, too, is about Rapunzel. I think it’s pretty beautiful. In fact, there are a few posts on that blog of which I am truly proud. “How about mango?” I ask. And even though the question is delivered entirely without context, she knows exactly what I’m talking about. So we skip off to my room and pore over paint chips (she prefers spiced pumpkin, by the way, and I think she may be right), and somewhere in the midst of all the scheming, a simple statement slips off my tongue. And again, my mother is awesome enough to know I’m not just talking about paint chips. I’m the kind of person who thrives on productivity. I have to produce something. I have to feel like something has been accomplished during my day. I have to have tangible evidence that I’m doing something worthwhile. But evidence isn’t always tangible. We can’t always see what we have accomplished, and that’s where things start to get complicated. That’s where I start to doubt myself and my purpose and a hundred other stupid things. My goal is a finished book—I call that my art. Yet there is a deeper work happening. I chase what I think is the art, but really that’s just the evidence… The real art is the invisible work happening in the depths of my soul as I uncover, sink, see, listen, and wait. The book is just the souvenir. Thank you, Emily Freeman, for turning my world on its head. For reminding me that I am more than this project that has me so completely frustrated. For reminding me that it’s not about the book. It has never been about the book. I’m realizing that now. And little by little, I’m learning to give myself permission to live right where I’m at. One day, one minute, one ever-faithful brushstroke at a time.